Choose: Size King Queen Twin Full Cal King Twin XL Split Cal King Full XL Choose: Mattress Height 6" 9" 13"
Fully protect your mattress investment by using Protect-A-Bed® Allerzip Smooth Mattress Encasement. 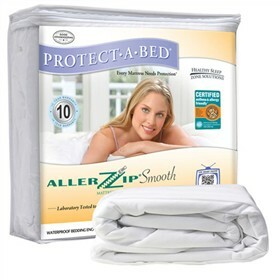 AllerZip® mattress protectors give you complete mattress protection for a healthy, allergy-free sleep zone. Patented BugLock®; three-sided zipper and AllerZip® seal gives you total protection against dust mites, allergens and bed bugs. AllerZip® mattress encasement is completely Bed Bug entry, escape and bite proof. The AllerZip® mattress encasement provides your whole family with a clean and healthy sleeping environment. The smooth surface is waterproof and stainproof, featuring our innovative Miracle Membrane®. Liquids and stains stay out, yet the state-of-the-art AllerZip® mattress protector remains breathable and comfortable. The Protect-A-Bed Allerzip Smooth Twin Size 6 inch Deep Pockets has many exciting features for users of all types. See the Protect-A-Bed Allerzip Smooth Twin Size 6 inch Deep Pockets product video and gallery images above for more details. The Protect-A-Bed Allerzip Smooth Twin Size 6 inch Deep Pockets is sold as a Brand New Unopened Item.